All this to introduce my card for today, which is a Double Z fold card (pronounced Du-bul-zed-fold)! I've been seeing a lot of these lately and since I'm doing some Fancy Fold techniques for my Technique Night classes, I thought it was the ideal time to try one out. I got out my Pop of Paradise stamp set and had some fun. Really, a Double Z fold card is very simple. You cut half a piece of cardstock the long way, 4 1/4" x 11", and score it at 5 1/2" as usual, but also at 2 3/4". Then you fold it forward on the 5 1/2" score line and backward on the 2 3/4" to form the Z. You also take a 1 1/8" x 11" strip of cardstock and score it and fold it exactly the same way, but then you turn it upside down and attach it to the card base so that the z fold is on the right instead of on the left. You would usually decorate the card base before attaching the strip. I used some Fruit Stand Designer Series Paper to decorate the back panel and it has a very tropical look even though it's not meant to be, don't you think? 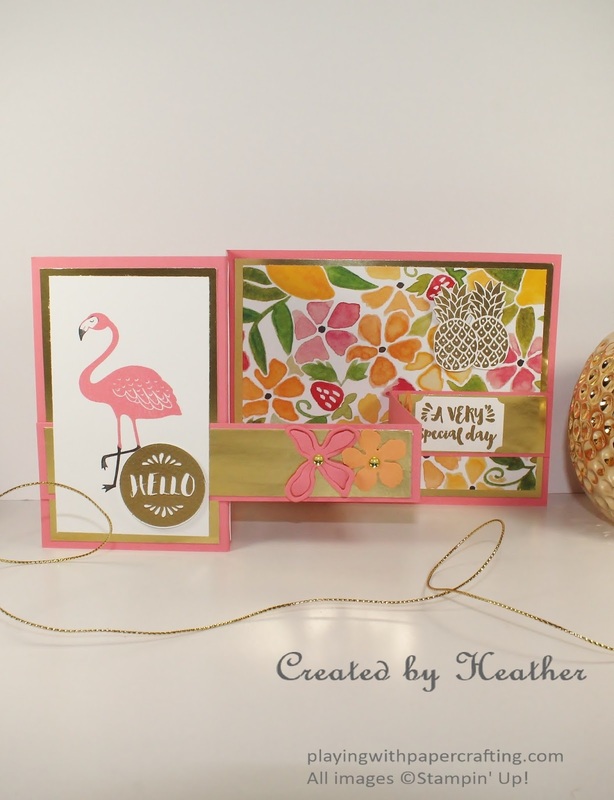 The pinks and oranges and greens give that impression, especially when paired with the Gold Foil Sheets as backing. Except for the flamingo on the front panel all the other images and sentiments, all from Pop of Paradise, are embossed in Gold Stampin' Emboss Powder. 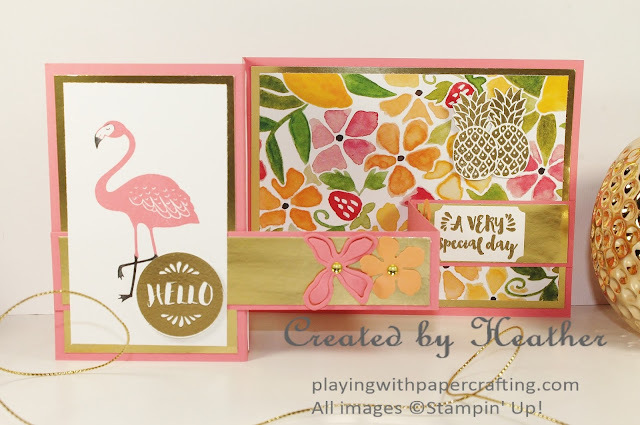 The Hello is punched out with the 1 1/4" Circle Punch and the "A Very Special Day" is die cut with the Tags and Labels framelits. 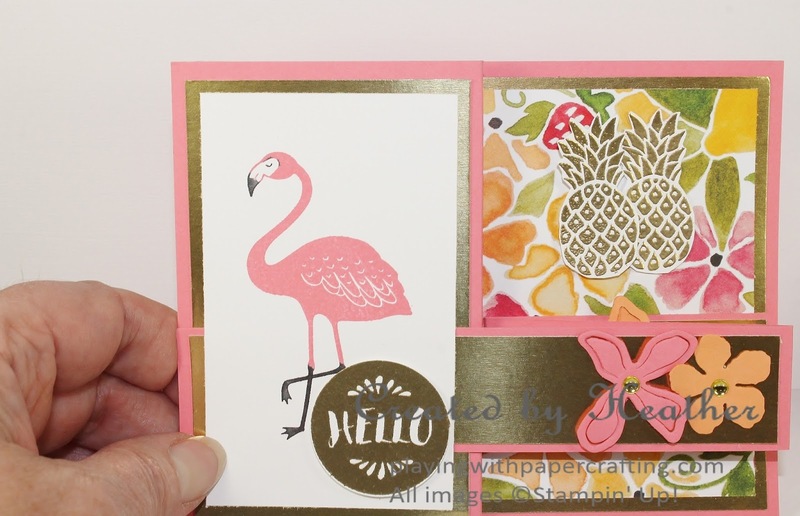 Don't you just love the gold embossed pineapples? 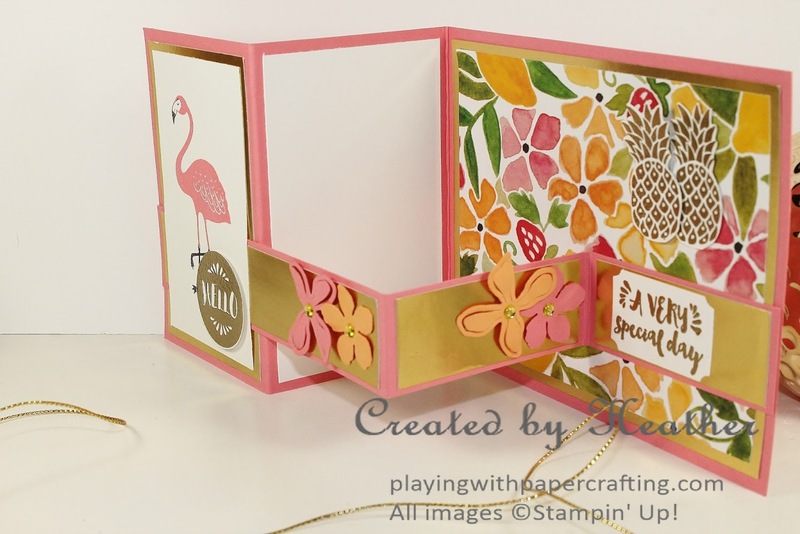 I used the Botanical Builder Framelits to add some real tropical-looking blooms to the project. Here's how it looks closed up to fit into a regular envelope quite nicely! And another view, to see more of the inside. Give it a try. It's easy and fun! It's here! 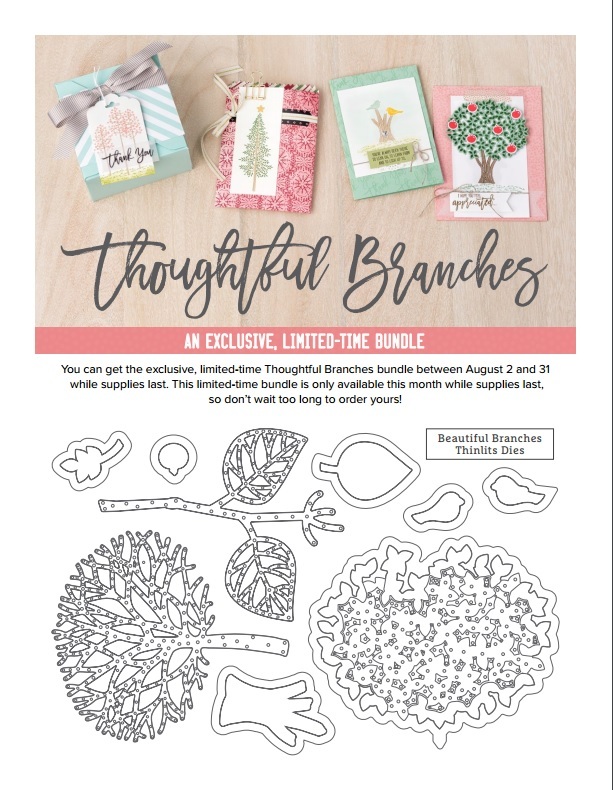 You can now order this awesome bundle! It's only available in August, but don't wait too long because it's only while supplies last! 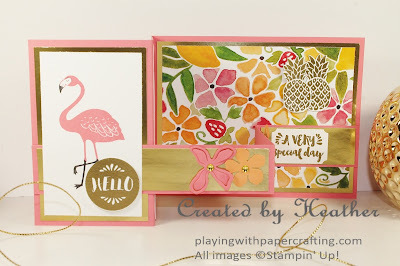 It's been a long time since I've seen a stamp set and thinlits that are so awesomely versatile! Don't believe me? Just check out the amazing variety of beautiful project on my Pinterest Board! And you can now cash in your Bonus Days Coupons! Use the codes emailed to you when you placed your orders, or pass them on to you demonstrator to enter for you. You have several options to order. You can go to my On-Line Store and place your own order any time 24/7. You can text or phone me at 250-768-7379. You can send me an email. But whatever you do, don't wait too long, or it will be gone! And Stampin' Up! Demonstrators were able to place their pre-orders from the new Holiday Catalogue today. I can hardly wait to get my delivery! Stampers, prepare to be amazed in about a week!! Also, I have ordered my catalogues and will get them out to you in your orders as soon as they arrive. If you would like one, the fastest way to get one is to order from me and I will put one in your order when I bring it by. Otherwise, let me know that you would like one, and you will get one in the second round of delivering. First priority goes to customers who have ordered from me this past year. 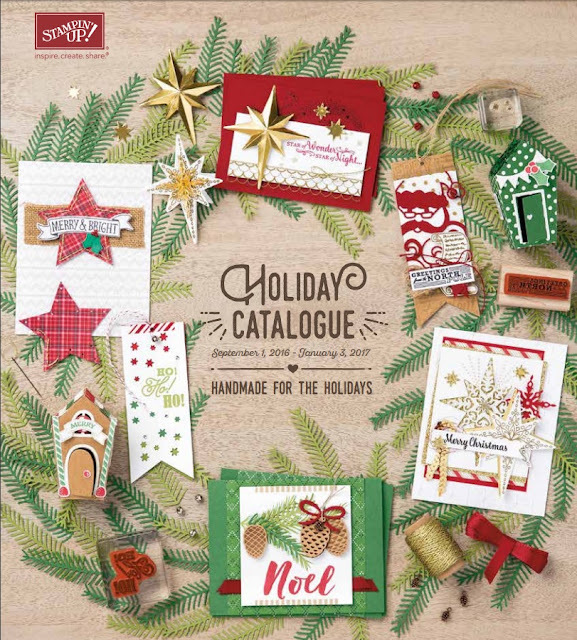 You might consider signing up as as demonstrator to get in on the early ordering from the new Holiday catalogue. 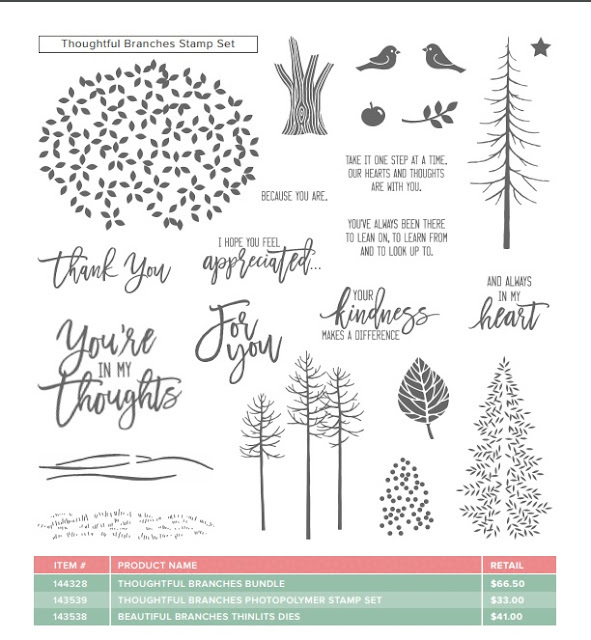 For just $135, you can get $165 worth of the new products of your choice, with free shipping and then minimum 20% discounts for the next four months, even if you do nothing else. What's the catch? There REALLY is none! REALLY! If you want a lot of stuff from this new catalogue (and you will once you see it), it's the approach I recommend. It makes the most economic sense. 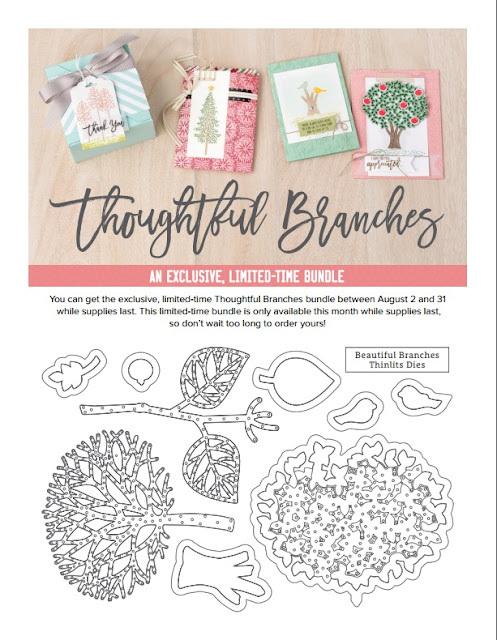 To sign up for the Starter Kit, just click on Join My Team, either here or in the top or side menus and follow the prompts. Or send me an email and I'll help you get started.